1. Preheat oven at 180˚C/gas 4. 2. Brush 8 ramekins with the softened butter and chill it for 5 mins. Then coat the ramekins with grated chocolate. then gradually add the rest of the milk until you have a smooth mixture. Boil for 30 seconds then off the heat, add the chocolate and whisk until smooth. 4. In an artisan mixer, whisk the egg whites to soft peaks. Gradually start to add in the sugar, whisking well in between each addition. 5. Add one third of the egg whites into the chocolate crème patisserie mixture and mix well. Now add in the remaining egg white and gently fold into the mix. 6. Divide the mixture between the ramekins. or until well risen and with a slightly wobbly centre. 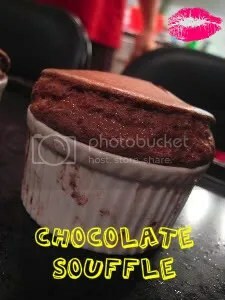 Remove from the oven and dust with the remaining cocoa powder.